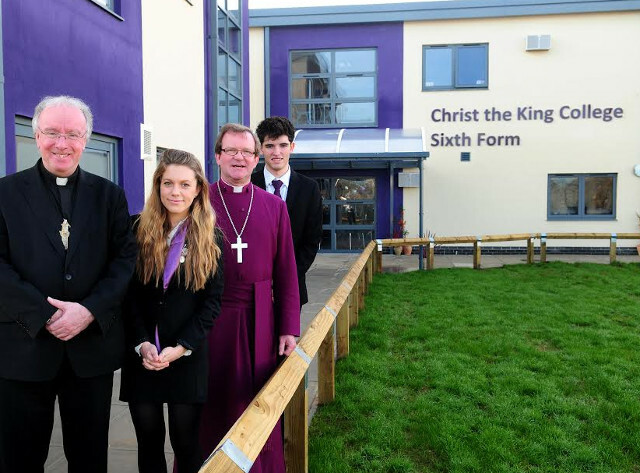 A special service was held to mark the opening of the new Sixth Form building at Christ the King College. Wednesday, 11th December 2013 was a day of tremendous satisfaction and a cause for significant celebration for Christ the King College. It was a day when the Principal, Pat Goodhead, asked that the College paused, reflected and gave thanks for what the entire College community had achieved. Through a service led by the Right Reverend Philip Egan, Catholic Bishop of Portsmouth and the Right Reverend Christopher Foster, who is the Church of England’s Bishop of Portsmouth, the College was finally able to mark the culmination of its journey as a popular and successful 11-18 Christian secondary school for the Isle of Wight, providing the rich and distinctive opportunity of faith based education all the way through to the Sixth Form. Housed in splendid facilities, now officially opened and blessed, the College is poised to build on its successes so far and face the future with confidence and excitement. 2 Comments on "Christ the King College celebrates new Sixth Form building"
I hope they gave thanks not just to their nailed god, but also to the taxpayer who funds their right to privileged access to education that some of the rest of us are denied.